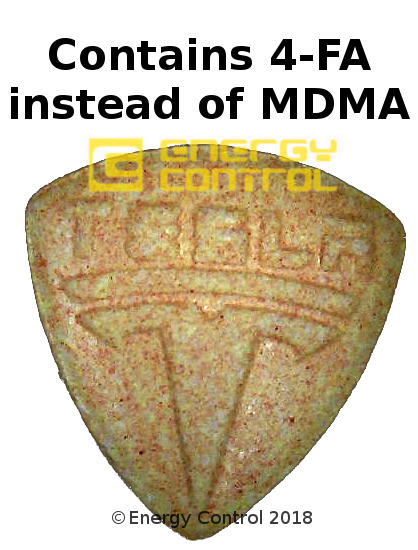 Tesla MDMA tablets with no MDMA in them at all have been detected by Energy Control in Spain. They were bought on a Darknet Market. The tablets contain a different drug called 4-FA instead, and although the risks of 4-FA are similar to those of MDMA, the dosage in the pills (190mg) is very large compared to a normal dosage of 4-FA (120mg). Although this doesn’t seem like a huge increase, 4-FA has a lower safety margin in some people where it causes headaches and in some cases, has been linked to bleeding inside the brain. Reagent tests can alert you when a pill contains something instead of MDMA. The pills in question are the orange tesla ecstasy tablets which are in the shape of a shield and have the Tesla logo on the front and a break-line on the back. There is at least one other orange tesla pill with exactly the same design, as well as a number of other tablets with almost identical designs, with some in different colours. 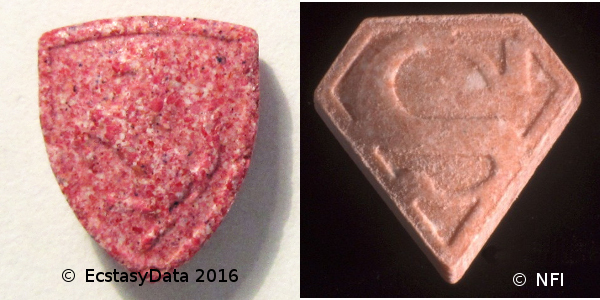 Although they may be easy to tell apart if you have them side by side, trying to do it from photos is hard, and if a friend tells someone “the orange tesla pills I took contained MDMA” then of course, there is no chance of telling if you have the same ones. 4-FA is an abbreviation for 4-fluoroamphetamine, it is a stimulant drug derived from amphetamine by the simple addition of a fluorine atom. The effects are similar to MDMA and it is even preferred by some people due to the lighter effects. It causes an increase in energy and sociability as well as feelings of increased wellbeing. The sociable and euphoric effects are most prominent for the first 6 hours, but light stimulation can persist for 8 hours and some users may find it hard to sleep even when they feel like the effects have worn off. Like all drugs, 4-FA can cause negative side effects, and although the overheating issues are much less prominent than MDMA, they are still a key concern. Similar to other stimulants, 4-FA can cause significant anxiety and even panic attacks, especially during the onset and at high doses. Concerningly, a small number of people report severe headaches and it is thought that these people could be vulnerable to causing bleeding in the brain at high doses. As with any pill, even if you think you know what’s in it you should always start with a small piece as a test dose, since even pure MDMA has significant risks and many pills contain very large doses. Although we can’t tell if a pill contains 4-FA instead of MDMA by looking at it, they can be distinguished very easily using reagent tests. 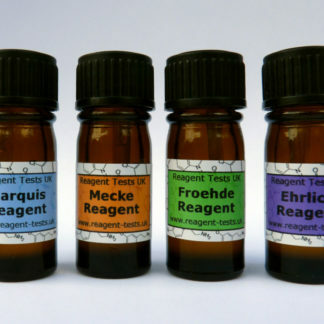 Reagent tests use a chemical mixture that react with drug molecules to create different types of dye molecule. The particular reagent used and the drug determine the colour of the dye, and so we can use the colour of the dye to see if the pill contains what we expect. If we get a colour we don’t expect then we know that the drug is not what we expect and therefore the risk is much higher than normal. So we can see that by using the marquis reagent first, we can immediately raise the alarm if there is not a purple/black reaction. Using a second reagent helps give us confidence about the first result – three reagents is the recommended minimum. If the two compounds were mixed together (very thoroughly) then we would see a result as if we had mixed two powder paints – this is why it’s necessary to throw away a sample if the result is unusual. In many cases, substances are not mixed perfectly, so it’s even possible to see specks of one colour mixed in with the second colour. This is very useful if you have crystals that you can separate with tweezers. 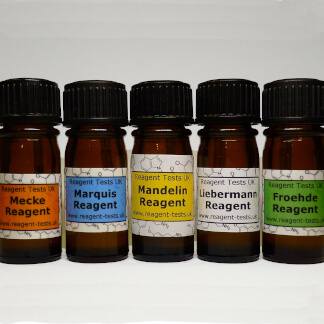 You can get a variety of different reagent tests in our shop. Both the MDMA and cocaine testing kits will be able to tell you if an ecstasy tablet has had the MDMA replaced with something else. PMMA is a chemical compound similar to MDMA but with some crucial differences. It completely prevents the body from regulating serotonin levels* and as a result, creates a high risk of fatal overheating. 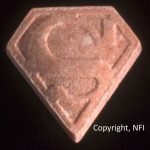 As if that wasn’t bad enough, it takes a long time to kick in, so people who think they are taking MDMA may take more as the slight effects lead them to think they just have weak pills. PMMA is easily detected with the froehde and mandelin reagent tests, but people can’t detect it if they don’t test! PMMA has been responsible for a number of deaths over the years but it typically only shows up in very isolated batches. Unusually, TWO separate batches have been identified in the last few days, leading Dutch authorities to launch a warning campaign to keep people safe. The pills concerned are pink superman pills and red ferarri pills, both pictured below. The pink superman pills are reported to have the superman logo on both sides, with an appearance similar to the batch that killed 4 people in the space of 2 weeks at the end of 2014. It only contains PMMA and the dosage in a single pill could be lethal. 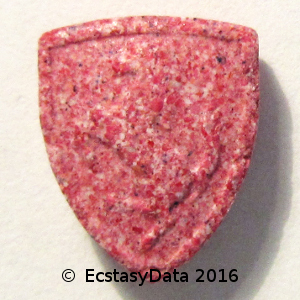 The Red Ferarri pill is a new press which is being sold online as containing “200+ mg of MDMA”. It was detected by EcstasyData and was purchased in Germany. It only contains PMMA. 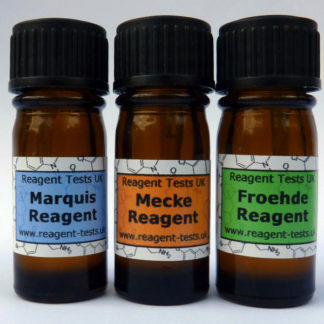 The MDMA testing multipack is our best selling selection and contains 30 tests of the marquis, mecke and froehde reagents. A test takes 60 seconds to carry out and could prevent a ruined night out – or worse. If your result is inconclusive, don’t risk it! If you can’t test for some reason, you must at least #CrushDabWait, but using your body to test if something is dangerous is obviously still very dangerous! * Interested in the sciency bit? PMMA is a strong inhibitor of the enzyme “Monoamine Oxidase”and a serotonin releasing agent. When MDMA releases serotonin this enzyme breaks down some of it to keep levels in check and reduce the chance of overheating (but high doses can still override this of course). With PMMA, serotonin is released but it has nowhere to go since the enzyme has been completely deactivated. This means that levels build continuously and the very high levels of serotonin lead to something called “Serotonin Syndrome”. This is where serotonin prevents normal regulation of temperature, and coupled with the stimulation from the drugs, the body goes into overdrive and overheats.